"Fake fighting just looks better than real fighting." On the first day of programming at the fifth year of the ATX Television Festival, stuntman Nick Benseman explained to the audience that fake fighting is not only prettier than the real thing, it even sounds better. "Controlled Chaos: The Art of TV Stunts" spent the hour deconstructing and explaining those badass looking fights on our TV screens every week. 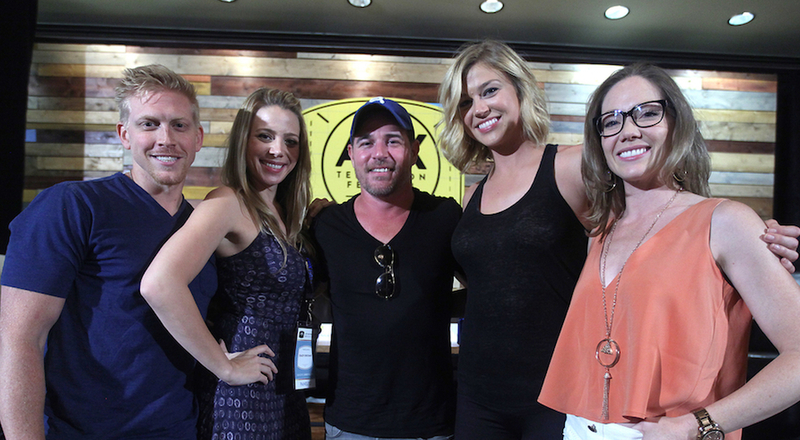 Besides stuntman Nick Benseman (KC Undercover), the panel featured actors Adrianne Palicki (Agents of S.H.I.E.L.D.) and Derek Phillips (Friday Night Lights) as well as stuntwoman/actor Nikki Tomlinson (The Walking Dead). It was moderated by fellow Friday Night Lights alum Stacey Oristano. With the help of video clips, the panel explained how stunts happen from beginning to end. They begin as "pre-vis" (short for pre-visualization) tapes, where a stunt choreographer like Benseman and fellow stuntmen record and act out a scene complete with toy guns and silly sound effects. Although it comes across as hilariously low budget, these clips are shown to the director and actors so everyone gets an idea of what the scene will look like before filming it. They all agreed that as helpful as a "pre-vis" can be, they only really happen on movie sets or big budget projects. Many times, especially in television, the choreography must be created and learned day of, illustrated by a clip of a fight scene from Agent Carter between Peggy Carter and Dolly that Benseman did. And sometimes (but rarely) actors themselves get to improvise the fight. Derek Phillips told an anecdote about a fight scene he had with Taylor Kitsch on Friday Night Lights. While they had it somewhat planned out, the director ended up telling Kitsch to surprise tackle Phillips so that they ended up just wrestling on the floor. Appropriately padded for safety, the spontaneity led to a very authentic-feeling scene of two brothers having a scuffle. Benseman and Tomlinson emphasized that rarely did that happen and rarely is it preferred because of the actors' safety. If there's anything to learn from a stuntman, it's that they consider safety their job and priority. They joked that actors like Phillips swear they can do their own stunts but it very rarely works out. Benseman said the best actors to work with on stunt work are the ones that understand that it's mostly "choreographed dance". Real fighting requires you to have a closed body and moves too fast for the cameras to capture, something that surprised Palicki who boxes regularly. Palicki told a story from when she was filming Wonder Woman. When her stunt double got injured, Palicki had to perform her own stunt at the end of a long day and ended up dislocating her foot and shutting down production for a few days - something that ends up being very costly for studios. So costly in fact that the Friday Night Lights contract required its actors to not do anything dumb and/or dangerous while filming. Phillips got in trouble for driving a motorcycle and Palicki got in trouble for skydiving. Benseman and Tomlinson also talked a bit about the life of a stuntman. A common motto in their line of work is, "if you're not working, you're training." When you can be called up to stunt for anything from martial arts to gymnastics to sword fighting, you have to know how to do it all at a moment's notice. It also often requires intense study (light stalking, Tomlinson joked) of their actor to learn how that person moves. Benseman has doubled for the likes of Eminem and Jesse Plemons on Breaking Bad while Tomlinson has doubled for everyone from Naomi Watts to Ashley Tisdale. Full of jokes and interesting clips, the “Controlled Chaos” panel was another great conversation at the ATX Television Festival that lets lesser known aspects of the industry take center stage, even if just for an hour.